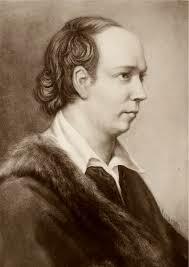 Oliver Goldsmith was born in 1728 in either his father’s rectory in Pallas, a townland outside Ballymahon, Co. Longford, or at the home of his maternal grandparents in Elphin, Co. Roscommon; he was raised primarily in Lissoy, Co. Westmeath. After graduating from Trinity College Dublin (where he had a rather chequered academic career), he half-heartedly studied medicine for three years in Edinburgh; he then travelled through continental Europe for a year, surviving by busking on his flute. He finally settled in London in 1756 and initially made his living as a journalist – or, more accurately, as a “Grub Street hack”. He soon came to the attention of Dr. Samuel Johnson and was taken into his literary circle. Dr. Johnson helped secure a publisher for Goldsmith’s perennially popular novel, The Vicar of Wakefield (1766). Johnson also provided the closing couplets to Goldsmith’s classic poem, “The Traveller” (1764). Goldsmith’s other great poetic achievement was, of course, “The Deserted Village” (1770), in which his lament for English rural depopulation was heavily informed by his witnessing of evictions and forced clearances in Ireland. Goldsmith not only excelled at fiction and poetry; he also wrote two plays. The first, The Good-Natured Man (1768), was not terribly successful, but demonstrated Goldsmith’s ability to undermine, or make subversive use of, the tropes associated with the “sentimental comedies” of his day. From an Irish point of view, it is also noteworthy for the fact that it includes the Irish character Flanigan the follower. (Incidentally, Flanigan’s friend, Twitch, was also played as Irish in the Gate Theatre’s Dublin production of 1974.) Goldsmith’s second play, She Stoops to Conquer (1773), is a brilliant comedy that has been continually produced across the world since it was written. The play’s plot is based around an incident that happened to Goldsmith himself while he was still living in Ireland (mistaking a country gentleman’s home for an inn). Dr. Johnson’s biographer, James Boswell, and many since have depicted Goldsmith as an “inspired idiot”, due to his whimsical sense of humour and his occasional “Irish bulls”; however, the biting irony in The Vicar of Wakefield (often missed by commentators), the proto-socialism of his great poems, and the satirical, outsider’s view of the English in his plays and The Citizen of the World (in which he pretends to be a Chinese philosopher observing the ways of the “strange” English) reveal him to have been a wise and sharp-eyed socio-political commentator. For more on this playwright from an Irish Studies perspective, see Michael Griffin’s book, Enlightenment in Ruins: The Geographies of Oliver Goldsmith (2013).